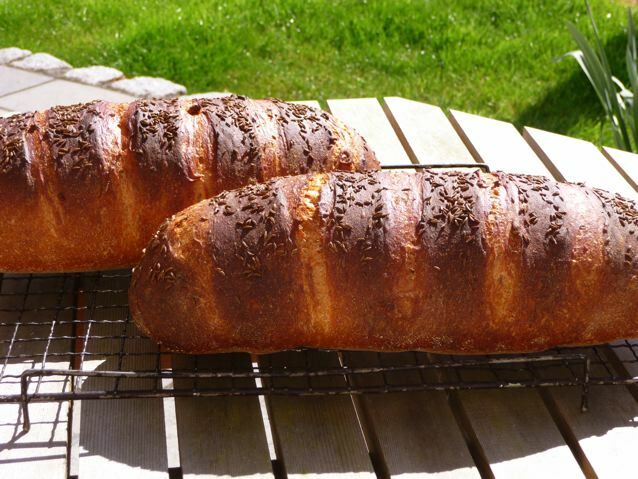 Last year I wondered if I could grow some caraway (carum carvi) and get enough seeds to make a couple of loaves of our favourite light rye bread. I bought two tiny plants which I found in a nursery. They didn’t do much, so I put them in the cold frame through the winter and this spring they are growing quite quickly. 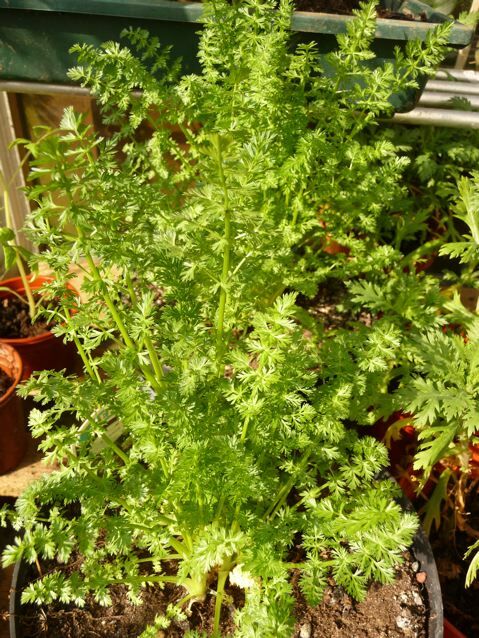 As you can see it looks a bit like coriander, or even carrots growing with feathery leaves. Yesterday I finally looked up how to grow it and discovered that caraway is a biennual so will take two years to produce seed, so this year should be the one! I might just have to put it in bigger pots as it’s growing furiously now – I don’t think it’s keen on being transplanted but I will take a chance. You can use caraway seeds in lots of different recipes. It is a love-it or hate-it taste! I like them with baby carrots, scrubbed but not peeled with the tops cut down to about a quarter of an inch, parboiled whole and then finished by cooking in a butter and brown sugar glaze put together with a little fresh lemon juice and caraway seeds. Lemon juice does something magical to carrots, makes them taste more carroty somehow….. Carrots taste better steamed or boiled whole. I have no idea why! If the plants set seed I will try and grow some new ones. In theory they should self sow around the garden, like borage does. We’ll see! 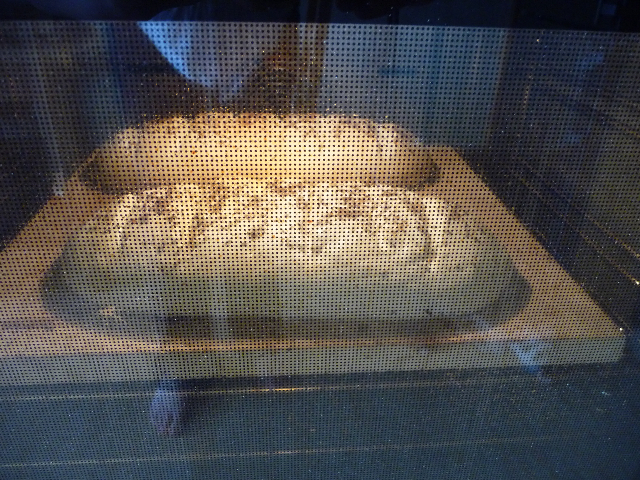 Next post : Rustic Bread! This entry was posted in Garden and tagged biennual, caraway, Garden, herb on 15/04/2010 by Joanna. This is a version of the classic Light Rye from Bread by Jeffrey Hamelman – one of the April breads that the Mellow Baking group is making. It’s a very light rye, the sort of bread that you have with pastrami and pickles, a hint of caraway aroma from the seeds pressed into the top of the bread, none in the crumb of the bread itself. The rye element is all in the leaven. I used to think this sort of bread was english rye bread as it was the one that we had most often in London in my childhood. 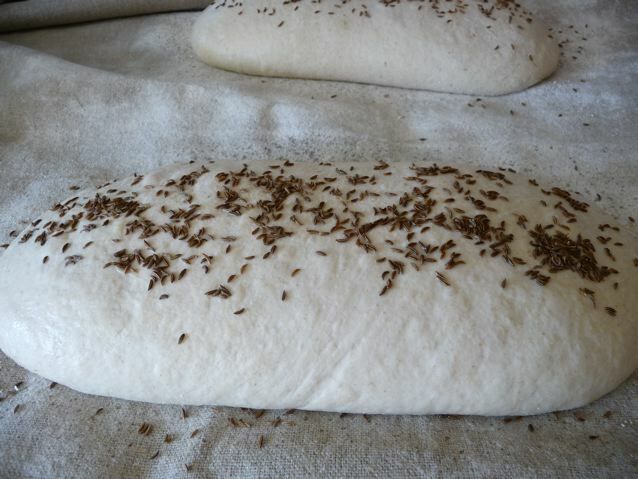 I forgot to add caraway seeds to the dough but you can add them of course, a tablespoon should be plenty. I used some german type 1150 flour for the starter. If you are making it and you have a choice between light and dark rye, then I have made a version of this before using half light and half dark rye and another time I simply sieved some of the bran out of the very coarse rye flour that I had available. The recipe suggests medium rye. I usually bake with what I have in the house. Waitrose import Canadian red spring wheat flour and bag/brand it as very strong white flour and I have been using quite a lot of it recently. It gives phenomenal oven spring due to the high protein levels in the flour. I autolysed the dough for 15 minutes before adding the salt. 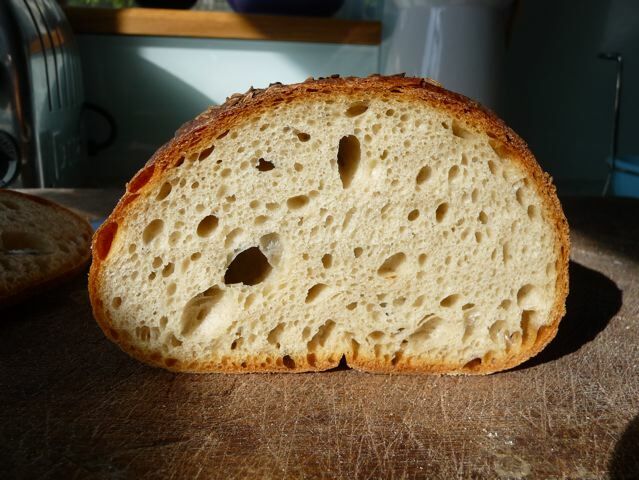 Like most of the bread I make this is handmixed and kneaded and I use Dan Lepard’s ‘light knead and leave and do the washing up method’ which has the added advantage that you wash the bowl up while the dough sits on the side and then it has a nice warm bowl to be popped back into! The whole notion of kneading dough for ages to develop gluten is a bit of a mystery to me. The gluten seems to develop fine with a series of short kneads and the magic ingredients of time and a friendly temperature. But as a home baker I don’t need to be as spot on with my timings as a commercial baker striving to replicate the same bread to a deadline! So to the bread: The pictures speak for themselves I hope. 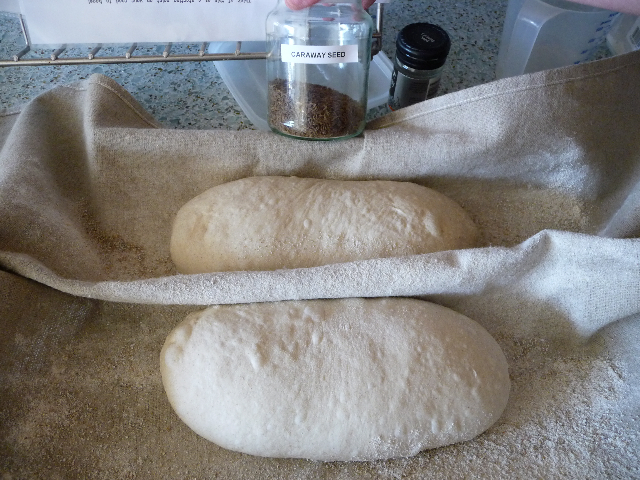 The dough developed fairly quickly and I shaped it into two ovals, proved them in a couche cloth, damped the tops down and sprinkled with caraway seeds, slashed straight across the dough and into the oven..
….baked them on a kiln shelf with steam in a little tray below the kiln shelf. I usually try to let the steam out once the loaf has sprung and taken on colour. I baked them quite hot, following the temperatures given in the book, and got the high baked crust you see in the pictures. I think I would drop the temperature a bit earlier and a bit lower another time, there was slight cracking in the crust which is not undesirable, but I have noticed that if you freeze a bread when the crust has hairline cracks, then when you come to defrost it the crust tends to break off or shatter when you cut it . I suppose the answer is not to freeze them but use them immediately! One loaf went to Mandy and Rudiger (anything with rye in it please!) and we have been eating the other. It’s a bouncy easy to eat bread, with a wonderfully tasty, thin but slightly chewy crust, and it was greeted with enthusiasm by the Chief Bread Taster. There was the odd hole ( big enough for a small mouse or a microbat maybe) but that just means more butter on the bread! I would highly recommend buying this book if you are looking for a comprehensive set of recipes for making a huge range of breads. It also has an enormous amount of information in it and was written with extraordinary love and care. I have bought quite a few bread books in the last couple of years in my search for knowledge, inspiration and general bread joy and this one hits the mark nearly every time! Some books you just look at the pictures and put them on the shelf – not this one. Ever since I first read it I thought I would like to work through the formulae and the Mellow Bakers group is a means of focus for doing this and for sharing problems and successes with some new and old baking friends, so do join in! 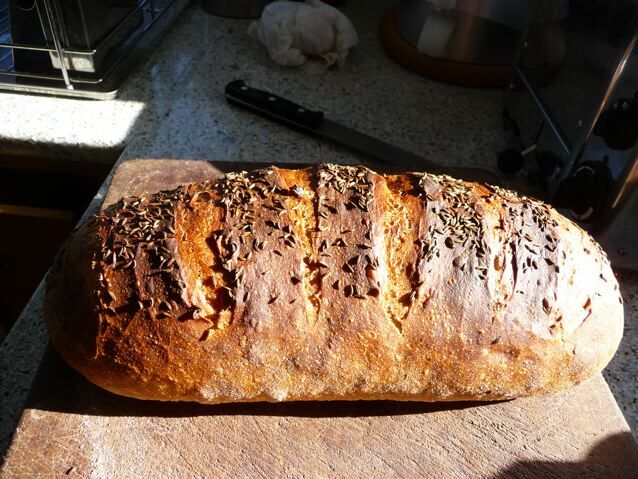 This entry was posted in Bread, Mellow Bakers and tagged Bread, caraway, Jeffrey Hamelman Bread, Light Rye, Mellow Bakers on 10/04/2010 by Joanna.